If you've been reading my blog, you know that sensitivities or intolerances to food, such as gluten, can trigger autoimmune processes in your body. Typically you have to have a genetic predisposition to autoummune attack to begin with, and then exposure to environmental substances (foods) can make your immune system turn against you. 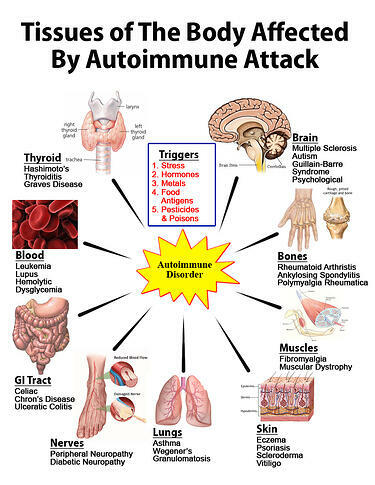 Afterall, an autoimmune attack by definition is when your own immune system (which is designed to determine self from non-self) starts targeting something in your body for attack, like a rabid dog attacking its owner! Less than 10 years ago, the recognition that antibodies against self-tissue, a primary mechanism in the development of autoimmune disease, were present YEARS BEFORE any recognizable symptoms, gave rationale and validity to the study of predicting vulnerability to developing autoimmune disease. Besides foods being a trigger for autoimmune processes, various sensitvities to other subatances, such as molds, metals, plastics, etc. can be a trigger as well. Up until now there has not been a way to determine of you were having an autoimmune problem due to chemicals or metals. Cyrex Laboratories is excited to introduce a breakthrough technology that identifies immune responses to chemicals bound to human proteins (neoantigens). This is the first test to measure the actual immune response to chemicals, instead of simply detecting the level of chemical exposure/load. Recently a good friend and colleague of mine was able to attend a seminar in California where the utility of this new test called Cyrex Array 11 was discussed in detail. My friend shared a few of examples of how doctors could use Cyrex Array 11 to help in unraveling the mysteries of the causes to various illnesses. Suppose a patient tested positive for Aflatoxin on Cyrex Array 11, and postive for Myelin antibodies on Cyrex Array 5 and they re-introduced grains again (after a period of time when grains of all types were avoided to aid in healing a leaky gut). They would be creating an auto-immune attack on their nervous system every time they ate a contaminated grain (often stored grains contain aflatoxins) Yikes!! Another example. If a patient tested postive for Bisphenol A (BPA) on Cyrex Array 11 and they also had GAD antibodies every time they drank out of a plastic bottled water, or used a plastic lid on their Starbucks cup, they could be creating an auto-immune attack on their brain, pancreas and colon. What if a parent had two infant children that have autism and the children tested positive for Tetrabromobisphenol A, (which is a fire retardant in pajamas). Every time they put on their PJ's, they could be initiating an auto immune attack on their brain. Cyrex Array 11 can also be a good one to determine when and when not chelate for heavy metals. Beginning Wednesday, July 10, 2013, doctors will be able to order the Array 11 – Chemical* Immune Reactivity Screen. Increased chemical antibodies indicate a heightened immune response and a loss of tolerance to chemicals commonly found in the environment. Immune reactivity may lead to diverse health conditions and autoimmunity. Cyrex Labs is confident that this breakthrough technology has the potential to transform dotors' ability to help their patients' lives.